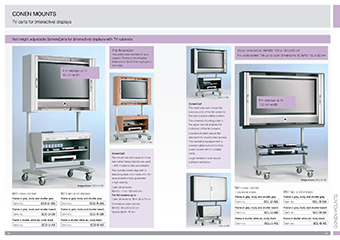 Our ScreenCart TV Rack has two solid shelves and a practical TV cabinet with a lockable roller blind to protect your TV from unauthorized access. Due to the roller blind, there are no doors in the way of the TV cart! The TV furniture is equipped with a covered cable duct and a triple power strip with 5 m safety cable. Large ventilation slots on the TV rack ensure sufficient air circulation. TV Rack for TVs with maximum W/H: 90 x 78 cm or 40"
Frame for all max. 40"